Definition at line 33 of file SystemZSubtarget.h. Definition at line 39 of file SystemZSubtarget.cpp. Definition at line 102 of file SystemZSubtarget.h. Definition at line 96 of file SystemZSubtarget.h. Definition at line 62 of file SystemZSubtarget.cpp. Definition at line 79 of file SystemZSubtarget.h. Definition at line 82 of file SystemZSubtarget.h. Referenced by llvm::SystemZTTIImpl::getIntImmCost(), llvm::SystemZVectorConstantInfo::isVectorConstantLegal(), and tieOpsIfNeeded(). Definition at line 83 of file SystemZSubtarget.h. Referenced by llvm::SystemZTargetLowering::SystemZTargetLowering(), and tieOpsIfNeeded(). Definition at line 89 of file SystemZSubtarget.h. Definition at line 86 of file SystemZSubtarget.h. Definition at line 180 of file SystemZSubtarget.h. Definition at line 165 of file SystemZSubtarget.h. Definition at line 111 of file SystemZSubtarget.h. Definition at line 168 of file SystemZSubtarget.h. Definition at line 153 of file SystemZSubtarget.h. Definition at line 142 of file SystemZSubtarget.h. Definition at line 123 of file SystemZSubtarget.h. Definition at line 191 of file SystemZSubtarget.h. Definition at line 120 of file SystemZSubtarget.h. Definition at line 208 of file SystemZSubtarget.h. Definition at line 145 of file SystemZSubtarget.h. Definition at line 156 of file SystemZSubtarget.h. Definition at line 171 of file SystemZSubtarget.h. Definition at line 114 of file SystemZSubtarget.h. Definition at line 117 of file SystemZSubtarget.h. Referenced by llvm::SystemZInstrInfo::canInsertSelect(), llvm::SystemZInstrInfo::FoldImmediate(), llvm::SystemZTTIImpl::getArithmeticInstrCost(), llvm::SystemZTTIImpl::getCastInstrCost(), and llvm::SystemZInstrInfo::insertSelect(). Definition at line 130 of file SystemZSubtarget.h. Definition at line 134 of file SystemZSubtarget.h. Definition at line 177 of file SystemZSubtarget.h. Definition at line 195 of file SystemZSubtarget.h. Definition at line 199 of file SystemZSubtarget.h. Definition at line 148 of file SystemZSubtarget.h. Definition at line 186 of file SystemZSubtarget.h. Definition at line 126 of file SystemZSubtarget.h. Referenced by llvm::SystemZTTIImpl::getPopcntSupport(), and llvm::SystemZTargetLowering::SystemZTargetLowering(). Definition at line 162 of file SystemZSubtarget.h. Definition at line 137 of file SystemZSubtarget.h. Definition at line 159 of file SystemZSubtarget.h. Definition at line 183 of file SystemZSubtarget.h. Referenced by llvm::SystemZInstrInfo::copyPhysReg(), llvm::SystemZRegisterInfo::eliminateFrameIndex(), llvm::SystemZTTIImpl::getArithmeticInstrCost(), llvm::SystemZRegisterInfo::getCalleeSavedRegs(), llvm::SystemZRegisterInfo::getCallPreservedMask(), llvm::SystemZTTIImpl::getCastInstrCost(), llvm::SystemZTTIImpl::getCmpSelInstrCost(), llvm::SystemZTTIImpl::getNumberOfRegisters(), llvm::SystemZTTIImpl::getRegisterBitWidth(), llvm::SystemZTTIImpl::getShuffleCost(), llvm::SystemZVectorConstantInfo::isVectorConstantLegal(), and llvm::SystemZTargetLowering::SystemZTargetLowering(). Definition at line 202 of file SystemZSubtarget.h. 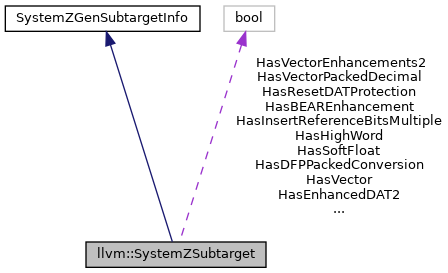 Referenced by llvm::SystemZTTIImpl::getArithmeticInstrCost(), llvm::SystemZTargetLowering::isFMAFasterThanFMulAndFAdd(), llvm::SystemZVectorConstantInfo::isVectorConstantLegal(), and llvm::SystemZTargetLowering::SystemZTargetLowering(). Definition at line 205 of file SystemZSubtarget.h. Definition at line 66 of file SystemZSubtarget.cpp. References llvm::GlobalValue::getAlignment(), llvm::GlobalValue::getParent(), llvm::TargetLoweringBase::getTargetMachine(), llvm::TargetMachine::shouldAssumeDSOLocal(), and llvm::CodeModel::Small. Definition at line 216 of file SystemZSubtarget.h. Definition at line 99 of file SystemZSubtarget.h. Definition at line 57 of file SystemZSubtarget.h. Definition at line 51 of file SystemZSubtarget.h. Definition at line 36 of file SystemZSubtarget.h. Definition at line 52 of file SystemZSubtarget.h. Definition at line 47 of file SystemZSubtarget.h. Definition at line 44 of file SystemZSubtarget.h. Definition at line 39 of file SystemZSubtarget.h. Definition at line 59 of file SystemZSubtarget.h. Definition at line 38 of file SystemZSubtarget.h. Definition at line 64 of file SystemZSubtarget.h. Definition at line 45 of file SystemZSubtarget.h. Definition at line 48 of file SystemZSubtarget.h. Definition at line 55 of file SystemZSubtarget.h. Definition at line 37 of file SystemZSubtarget.h. Definition at line 54 of file SystemZSubtarget.h. Definition at line 41 of file SystemZSubtarget.h. Definition at line 42 of file SystemZSubtarget.h. Definition at line 56 of file SystemZSubtarget.h. Definition at line 60 of file SystemZSubtarget.h. Definition at line 61 of file SystemZSubtarget.h. Definition at line 46 of file SystemZSubtarget.h. Definition at line 58 of file SystemZSubtarget.h. Definition at line 40 of file SystemZSubtarget.h. Definition at line 50 of file SystemZSubtarget.h. Definition at line 43 of file SystemZSubtarget.h. Definition at line 49 of file SystemZSubtarget.h. Definition at line 53 of file SystemZSubtarget.h. Definition at line 62 of file SystemZSubtarget.h. Definition at line 63 of file SystemZSubtarget.h.